2015 Nissan Titan XD "Triple Nickel"
The Titan XD has already made waves in the industry, but Nissan wants more. That’s why the automaker has pulled the covers off its plans to snag a land speed record with its all-new pickup. This project and its vehicle, affectionately called the “Triple Nickel” thanks to its 555 pound-feet of torque, are still in the building phase, but will soon compete in the D/DT and FIA A-III-9 classes at Bonneville. Amazingly enough, the Triple Nickel isn’t some tube-frame chassis with a fiberglass body. No, this is a full-fledged pre-production Titan XD with nothing more than a handful of modifications that allow it to race. This isn’t Nissan’s first rodeo; the automaker set a land speed record back in the mid-1990s with a 1994 Hardbody pickup powered by a four-cylinder gasoline engine. It set multiple records, including its fastest official run of 142.9 mph on the salt flats. Cummins, the builder of the Titan XD’s 5.0-liter V-8, has an even more storied history dating back to 1931. That year, Cummins engines powered vehicles that set records at Daytona Beach, the Bonneville Salt Flats, and airstrips in Wilmington, Ohio. 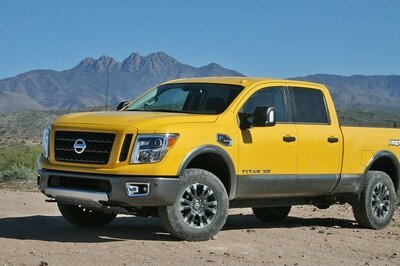 So let’s take a glance at Nissan’s Triple Nickel Titan XD. Continue reading to learn more about the Nissan Titan XD "Triple Nickel". It’s easy to see this Titan is no one-off racer; it’s a product of an assembly line. Nissan Engineers then worked their magic by adding a custom front air dam, a cargo bed cover, a nickel-colored body wrap, high-speed, Mickey Thompson tires with air-deflecting wheel covers, and a suspension lowering kit. Beyond that, there’s not much different from a standard Titan XD – well, except for the rear-mounted parachute. Currently the truck has most of its stock interior intact. Engineers have already replaced the driver’s seat with an Ultra Shield safety seat, but plans are in the works for a full roll cage and additional safety systems. 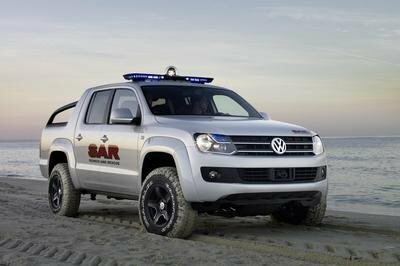 There’s not much more information yet, but expect the truck to be fully race-ready within the next few months. Nissan has kept quiet about its drivetrain modifications, though its safe to assume the truck’s top speed governor has been fully disconnected. It’s likely rear-end gearing has been swapped for taller cogs, allowing the engine’s relatively low redline to come much later in the speed run. With 310 horsepower and 555 pound-feet of torque when stock, the 5.0-liter Cummins V-8 turbodiesel has plenty of grunt to get the truck moving. 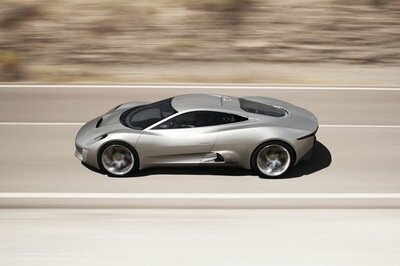 The current land speed record is 115 mph in the FIA Class A-III-9 and 191 mph in the D/DT class. Both records are squarely in Nissan’s sights. Nissan isn’t new to breaking records or chasing top speed goals, but this is the first time in more than 20 years the automaker has attempted such a feet in a pickup truck. It will be interesting to see how this all plays out and what modifications the Titan XD sports. While top speed runs might not be the goal of most Titan XD owners, this will surly be a great promotional and marketing gig for Nissan. Fresh from being named the "Truck of Texas" by the Texas Auto Writers Association (TAWA), the 2016 TITAN XD, with its Cummins® 5.0L V8 Turbo Diesel, makes an ideal, if unconventional, land speed record racer. 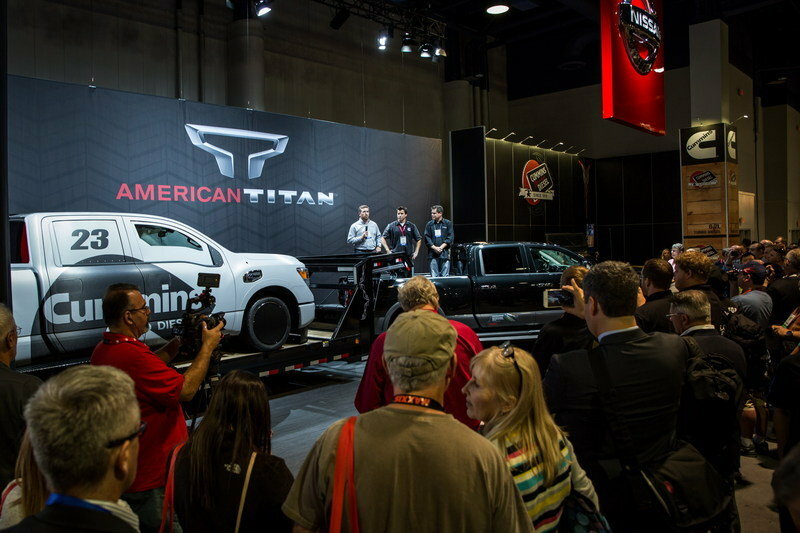 Dubbed "Project Triple Nickel" as an homage to a stock TITAN XD’s 555 lb.-ft. torque rating, the specially outfitted truck was revealed today at the 2015 Specialty Equipment Market Association (SEMA) Show. 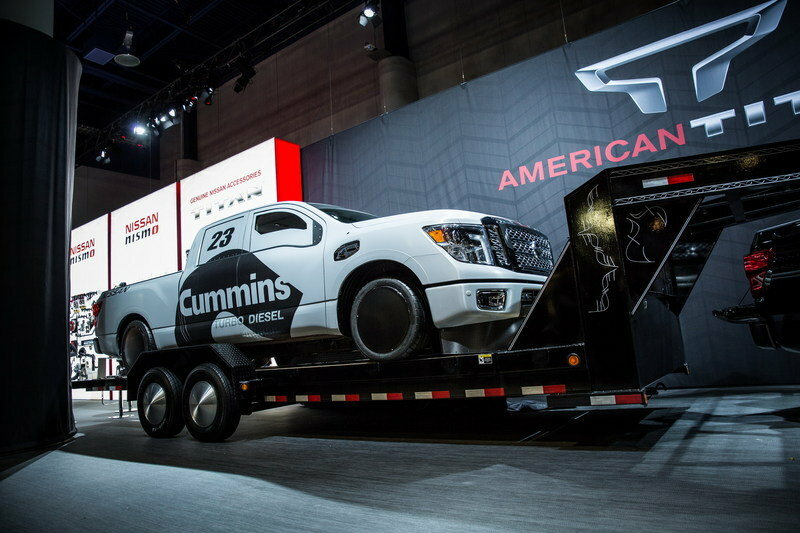 "What better place to show off the latest collaboration between Nissan and Cummins than the 2015 SEMA Show," said Pierre Loing, vice president, Product Planning, Nissan North America, Inc. "Land speed record racing is one of the most intriguing and difficult forms of motorsport, and what we learn from this undertaking will be beneficial to all as TITAN is continuously developed." "Project Triple Nickel" is a working collaboration between Cummins and Nissan North America. 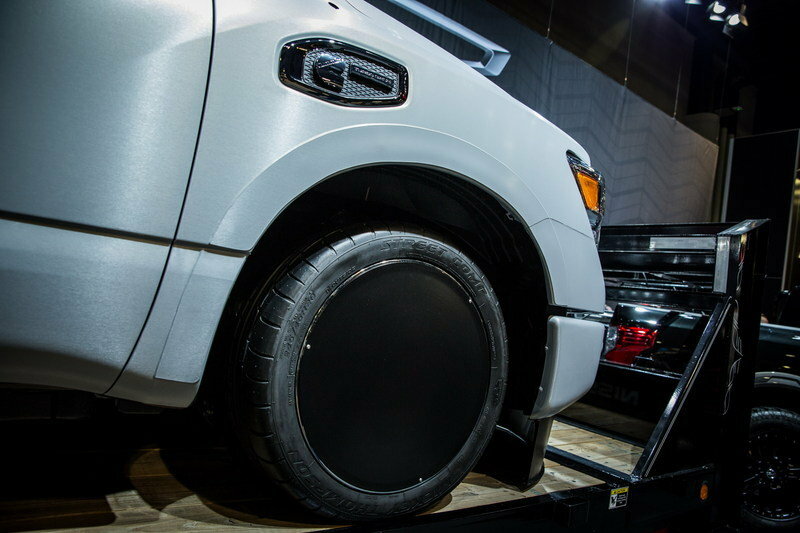 Modification began on the 2016 TITAN XD a few weeks ago, and thus far it features a special lowered suspension, salt-flat style disc wheel covers, Mickey Thompson tires, an Ultra Shield seat, a Stroud Safety parachute, a custom-fabricated front air dam and bed covers and a custom, brushed nickel-colored wrap. Additional modifications – including a roll cage, additional safety equipment and more – will be added within the next few months as the truck is developed with an eye toward setting new class speed records. Both companies currently employ land speed class record holders, both at Bonneville as well as the East Coast Timing Association, which holds events in Wilmington, Ohio. Those employees, on a volunteer basis, will help guide the ongoing project, with the truck competing in the D/DT class (current record 191 MPH) as well as the FIA class A-III-9 (record 115 MPH). 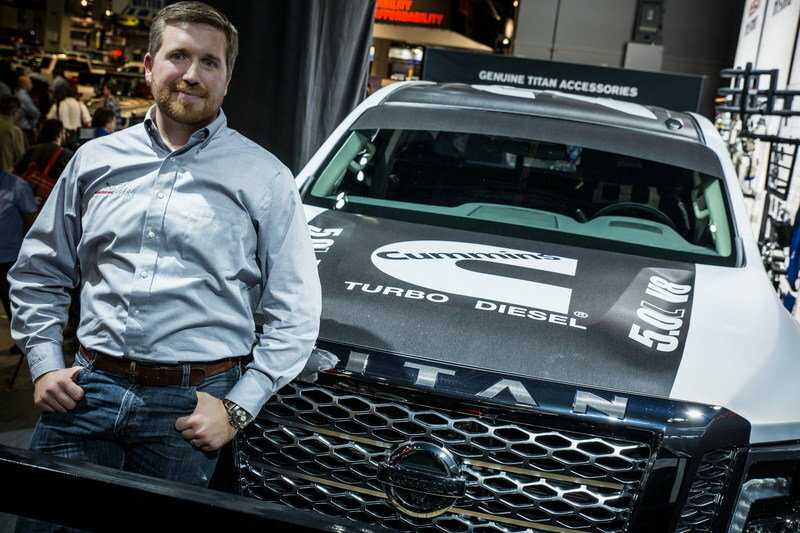 "Cummins and Nissan have had an innovative partnership for more than five years, with excellent results, including the award winning powertrain for the all-new 2016 TITAN XD truck," said Jeff Caldwell, general manager of Global Pickup & Van Business, Cummins. 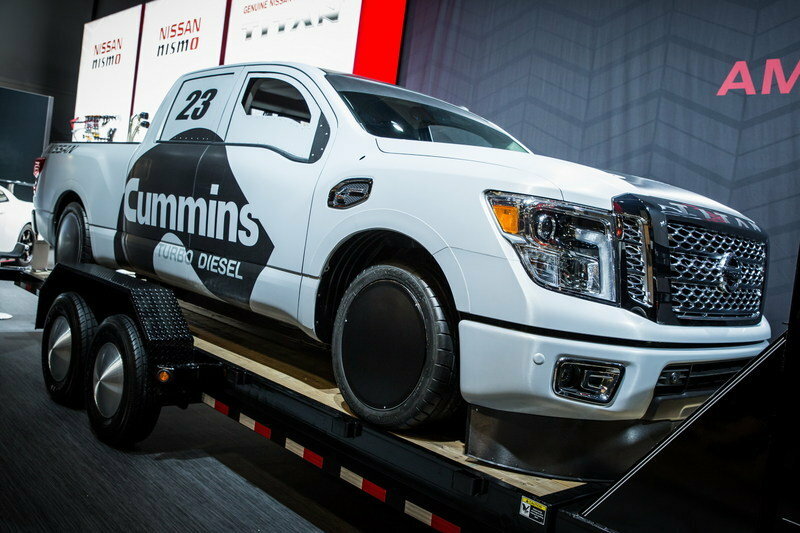 "Our working teams have been discussing a land-speed record racing project for some time now, and we are thrilled to debut this truck at the 2015 SEMA Show. Our founder, Clessie Cummins, would be proud of the volunteers willing to spend the time pushing his diesel to its limits." Cummins has a long history in land-speed record racing, starting in 1931 on Daytona Beach and continuing to the salt flats of Bonneville and the airstrips of Wilmington, Ohio. Cummins inherent durability and endurance has also been proven at the Indianapolis Motor Speedway, in off-shore racing, DAKAR rallies, and countless competitive pulling events demonstrating the "overkill" characteristic that make up the Cummins DNA. 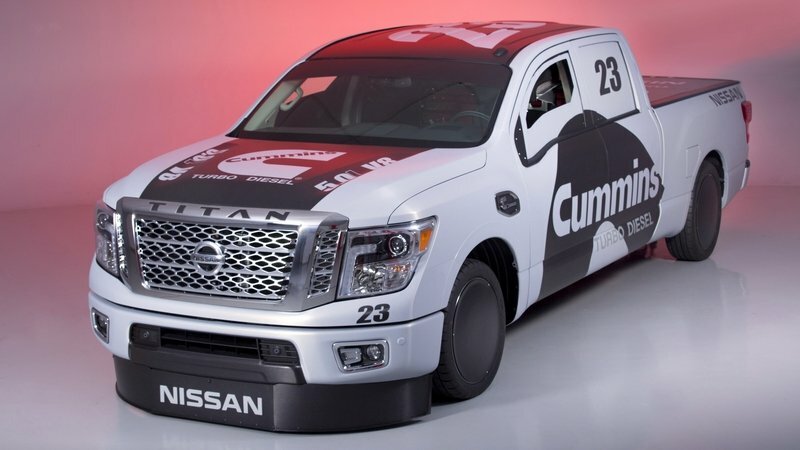 Nissan also has a history in land speed record racing, most recently with a 1994 "Hardbody" compact pickup truck, which raced at El Mirage and Bonneville. That truck set multiple records in the mid-1990s for a four-cylinder truck, most notably a run of 142.9 MPH on the salt flats. "Project Triple Nickel" is on display at Nissan’s SEMA booth #30024, Nissan’s official booth at the 2015 show.